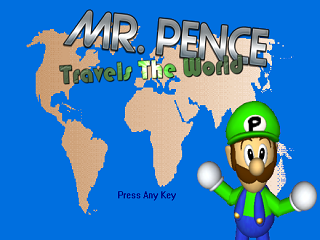 Travel the world once again in Mr. Pence Travels The World: Definitive Edition! Mr. Pence and Germino are trying to get rid of the evil that's left on their world after the War from 5 years ago. But someone is trying to stop them! Who is it? Play the game and find out! I'll support any CT Fusion users when/where possible (I'm a CTF user myself), though this one seems questionable. - If you give the user to change the controls, it should be for EVERY command. One of the button to fire, seems to always be Ctrl. - Pressing Shift will always make him say "Yahoo" regardless of changed controls. I've used Clickteam products the entire time I've been on here, though nobody ever seems to acknowledge this. You're the guy who made the MM engine, right? Super cool stuff, man! You really push it to the limits, I have to say. I always like when people make sillier stuff around these parts, and thankfully it seems this might be coming back more than I thought it did. We absolutely need more of this kinda thing.